And a new challenge at Crazy 4 Challenges! This week we were asked to make our favourite kind of card. My faves are always interactive, in particular shakers, and summertime themed. I combined both into this card. This fun little shaker element uses dies from WPlus9, Making Waves. There is enough room for some foam under the top edge of the waves so I could make the shaker with two different colours of fillers. The top has plain white confetti and the bottom has a mix of sequins and beads from Lucy’s Little Things. I created a circle mask for the sun. If you do this, be sure to keep the negative portion of your mask too as you will need it. The circle part to keep the sun white while you ink the sky and the surrounding paper to keep the yellow for the sun from getting into the blue sky. The little fishy is from an older Echo Park die set with a sailboat. 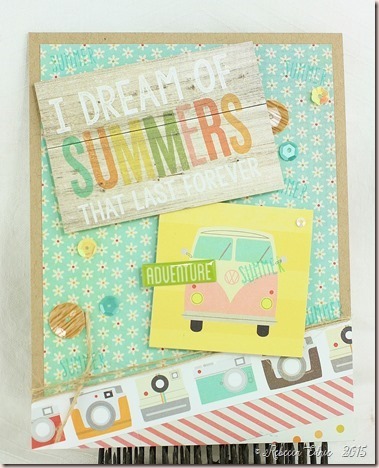 The sentiment is from Hello Summer from Neat & Tangled, both the die and stamp. I make summer cards even in the winter, clearly, so I agree 100%. I hope you will join us at C4C for this first challenge of the year. What challenge could be easier? Actually, I had to decide what was my favourite! I do have a lot. That’s why this blog is called what it is! I can never decide what my favourite is! I thought about making a shabby chic or vintage card. Or maybe one with watercolouring. Or how about some Copic colouring? ooh, or maybe some Prismacolour or Faber-Castell pencils? oh, I know, what about a mixed media masterpiece? See, hard for me to decide! I went with using a new-to-me stamp set and die. So apparently yesterday was Barefoot Day which makes that the theme for Crazy 4 Challenges. Which suits me fine as I regard socks as torture devices only to be worn when desperate! That means I’m barefoot anytime I’m inside and as much of the year as I can manage outside. All the papers are from Authentique, a pack called Utopia. The flamingo is an Echo Park die that I cut from more patterned paper. To make the dots not quite so prominent, I added some Worn Lipstick Distress ink. Then it was a bit too plain pink so I added some orange, just a touch, with Marmalade to mimic the flowers. I hand cut the monstera leaf, I just love those, don’t you? So vibrant in colour and organic in shape! The hibiscus flower (or whatever it is) is a wood veneer accent that I coloured. I filled the Polaroid-style frame from Simon Says with various Lucy’s Sequins. The aren’t as bright as the flamingo but that’s ok as I wanted the flamingo to stand out anyway. And they do look brighter IRL. I hope you can find something in your stash that is barefoot so you can play along. Basically any bird or animal that isn’t dressed in some sort of outfit with shoes will work so hopefully you have lots to choose from! Even some sea creatures in shells have a ‘foot’, snails do too! So lots of ideas you can work with. Head on over to our blog and link up your project! 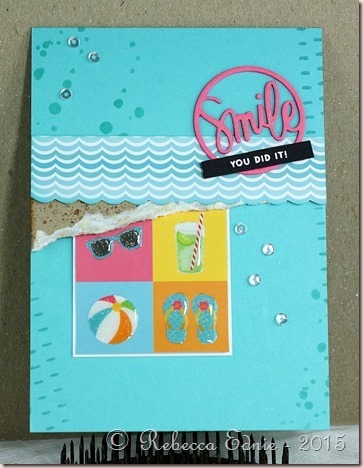 This week for Crazy 4 Challenges, we were asked to make a card with a summer destination theme! Yeah, I could make summer cards all year round (and sometimes I do!!!) BEACH BABY!Yeah! I recently got some new dies from Echo Park including this lovely retro swimsuit and flamingo! Aren’t they so fun! I also won a $20 gift certificate to Avery Elle and after much difficult decision making (have you seen their website?? It’s da bomb dot com!!) and throwing a few extra bucks into the mix, I came away with some amazing products including the sweet Bunting stamps and dies! You can get them at any sewing store but they do come smooth too, for finer, thinner fabrics, so be careful which one you buy. I’ve also got one with less defined teeth and they won’t pierce paper so check the ones you see and get the wickedest looking teeth you can get! Use a foam mat under the paper and when you are done, you can sew by hand if you wish or just trace the line with a gel pen! If you prefer zigzags, just run a second line of holes next to the first and connect them with a ziggy line! Like what you see? Click subscribe on the sidebar to receive all my posts in your inbox! Isn’t that banner so cute!? The die set comes with a super fine ‘string’ for hanging all of the cute bunting bits. I glued my twine to it to get a really nice arc in it. The circle die cut is Triple Tear from Spellbinders which I sponged with some matching inks. Well, actually I inked first and cut second! The flamingo, glasses and swimsuit are all sponged lightly along their edges to help them stand out more. For the wing, I used the negative die cut as a stencil! It was the perfect shape! The legs and beak were coloured with Copics. This busy mama ain’t got no time for cutting in multiple colours when I can help it! Ditto for the glasses, that’s turquoise paper under the dark brown lenses (I know, it looks black). I even did that with the word panels. I’d planned to piece in some coloured cardstock but when the die didn’t cut all the way through, I just decided to carefully ink the letters with a Copic marker. Worked out really well and it was faster too! No piecing those tiny letters and especially the even tinier centers of some letters! At the end, I added a bit of white gel pen on the flamingo and sunglasses. Swimsuits aren’t very shiny so I left the gel pen off. A couple of matching sequins and I was all set for the beach! TIP: Did you guys know that Copic just came out with a fine tip nib for the Sketch marker? I KNOW RIGHT??? I bought 5 packs (of 3) that very same day! Get them at Imagination International. The email I got said supply was limited so hurry on over! I hope you can play along with the challenge this week at Crazy 4 Challenges. When a lot of people play it just makes all our hard work seem worthwhile! Come on over and join! I can’t believe the summer is almost over. Only a couple weeks left! Where did it all go? There were so many things I wanted to do and I hate winter with a passion. So this card represents what I’d like to do with the little bit of summer that’s left. Go on a road trip! I’m not sure where but we just bought a new van! YEAH! So I think once we actually pick it up, a driving trip is something we need to try! Armed with iPads and tablets of course! I was stamping SUMMER randomly around the card when I smudged ink on the VW. So I had to place another stamp and a sticker over top. Does it work? School ends at the end of June here in Ontario. So many other bloggers are already past this stage with their kids but our last day of school is today. 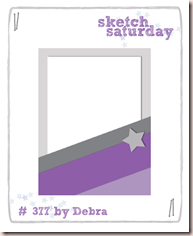 This one was inspired by Retro Sketches 169. I’m also entering this in the SSS Wednesday Challenge Anything Goes. The papers are older October Afternoon papers called Schoolhouse. This is a pretty basic card but it was fun to make. I kept it free of too many embellies but I did add Gl;ossy Accents to the third apple. I was inspired by another Retro Sketches sketch and an ombre challenge (don’t remember which one) for this card but they have ended. 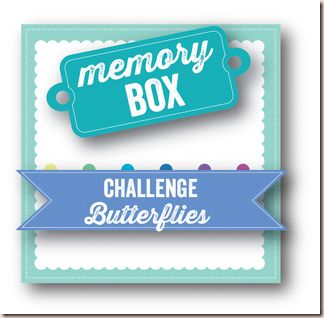 But, I also made this one for the Memory Box butterfly challenge. And it is still going! The pink part of the butterfly is painted with watercolours. Then I added the outline butterfly on top. I’m also entering this in the SSS Anything Goes challenge. I have been playing quite a few challenges lately but always seem to run out of time to blog the cards before the deadline! Well, I finally found some time and actually remembered so this is one of a few posts with cards I’m entering. sorry to post so much all at once! This was for three challenges, two of which have ended sadly. 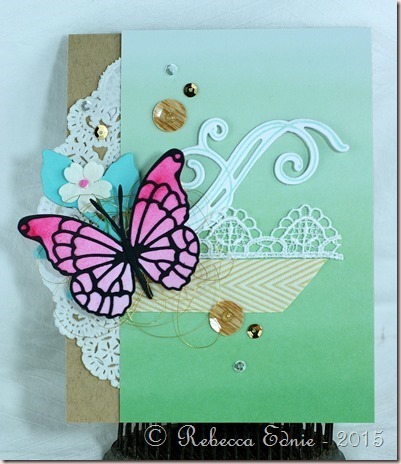 JUGS challenge to use layered die cuts and Retro Sketches 168. 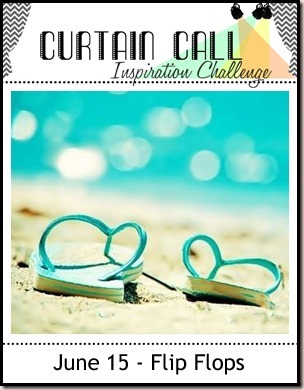 But, the Curtain Call challenge is still open! yeah! Most of this is pretty straight forward. On the kraft layer, I inked it with Distress ink and applied light moulding paste to the edge to mimic the frothy front edge of waves. 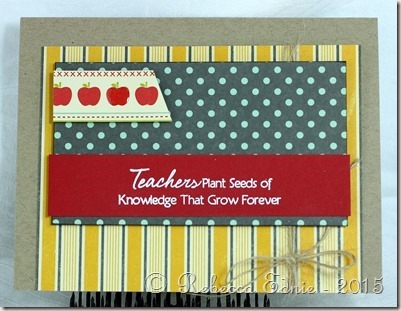 The sides of the card were sponged through a stencil using the same colour ink as the cardstock. I’m also entering this in the SSS Wednesday Challenge Anything Goes. Stamps: You Did it-SSS, sand stamp-SU! I got some new Kaisercraft paper and it was so fun to play with it. My mojo has been a bit low lately; I’ve been doing so much organization, it’s kind of sapped my creative energy. But as I worked on this, I just got more and more happy. I have to make a note to myself that anytime I’m not inspired I should go to this paper pad! Click on the photo to visit the challenge. To make the sun set background, I used Distress Markers. To make sure that the colours blended, I spritzed the stamp then dabbed off the area where the colours meet. Then I spritzed again. I love the effect! 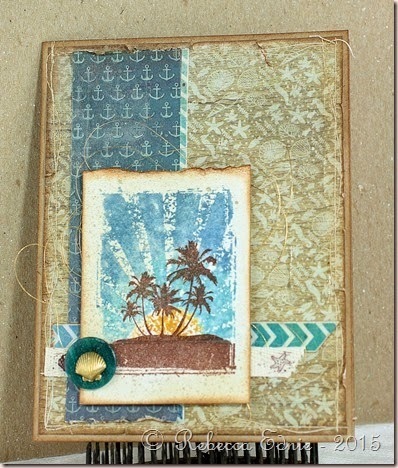 I stamped on the island using my MISTI to line everything up. It wasn’t perfect but it was user error. The MISTI placed the stamps exactly where I aligned them. I love this tool and it is totally worth the cost. The card was sprayed with gold Glimmer mist when I was done and it looks great! Shame it doesn’t show up. I also added a few brushstrokes of Rock Candy Distress Crackle Paint. You can’t see it very well as the angle isn’t right and the cracks are very fine but it does add a bit more texture. The button was don a while ago so I don’t remember what I did too well but I remember adding Copic airbrushing to change the colour. Then the ink stayed tacky so I covered it with, I think, Glossy Accents. The finish ended up kinda cracked and textured which was really cool. The charm is covered in Sharpie paint pen to change it from silver to gold. 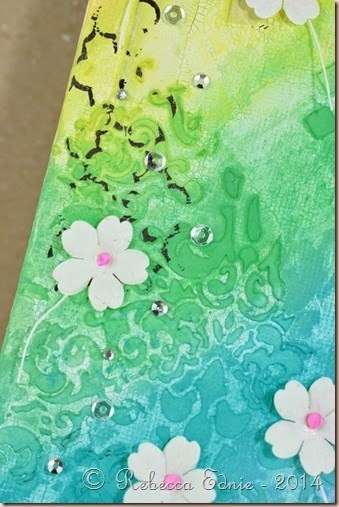 I was inspired by the Simon Says Stamp Monday challenge blog to make this canvas. The challenge was to make something starting with the letter B. 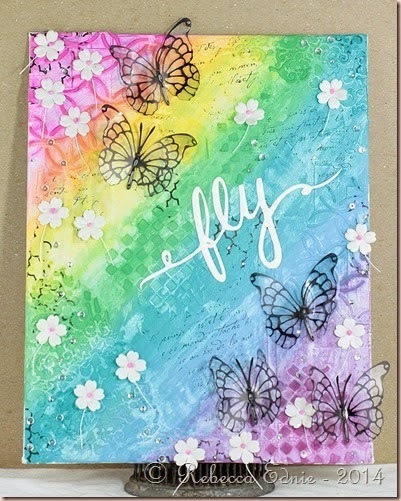 Then the Wednesday challenge’s theme was Things that Fly. How perfect! I used a canvas board from the Dollar store that I prepped a while ago. I started with some patterned paper strips which you really can’t see but they do add some texture. I covered that with gesso. 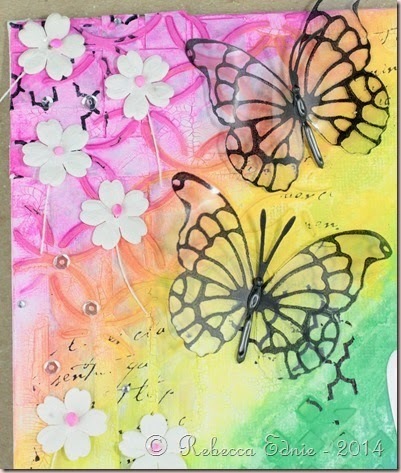 Then I randomly added some texture paste using three different Prima stencils. Then I experimented with the new Prima line of art supplies, using the white crackle paste to apply a thin, splotchy, uneven layer over the canvas, adding a bit more in blobs near the edges. I left it that way until I decided what I wanted to do with it. I’m a big fan of Laura Bassen and her love of rainbows has worn off on me. So I went with a bold fun paint scheme. Usually when I do mixed media art, I use Golden Fluid Acrylic paints which are much higher quality than craft paint. But I didn’t have all the colours I needed so I went with some craft paint. Wow, what a difference. Besides the opacity (fluid acrylics are somewhat translucent), there was a huge difference in drying time and workability. I can keep adding water and move the fluid paints around almost indefinitely while the craft paints didn’t react to the water in the same way. You can see the difference near the stencilling. In the purple and pink areas, the fluid paint pooled nicely just like I wanted it to. But the craft paint didn’t thin out in the same way so it covered everything more equally for a less dynamic effect. But if you want opacity, the craft paints are great! I randomly stamped a couple background stamps without using a block which makes it patchy and uneven. 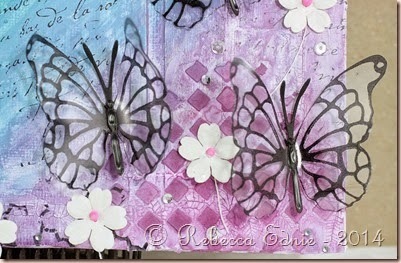 The butterflies were created by stamping on die cuts of Art Parts Clear Film. I made the stamp using Quikutz stamping foam which I die cut using a Memory box die. Then I cut the art film with the matching solid die and stamped it with Staz-On ink. Then you form the butterflies into any shape you want with a heat gun. You can’t keep it too close or it will start to shrink but it can take quite a bit of heat from a bit further back. The die cut bodies and antennae from black cardstock and covered them with black Liquid Pearls. The middles sunk for some reason but I liked how it looked anyways. More insect like and less perfect. The word was hand drawn, cut from cardstock and covered with white Glossy Accents. If you have any questions, let me know. I’m also entering this in the Crazy for Challenges #277 to bring on the bling. I used rhinestones, Liquid Pearls and sequins on this.